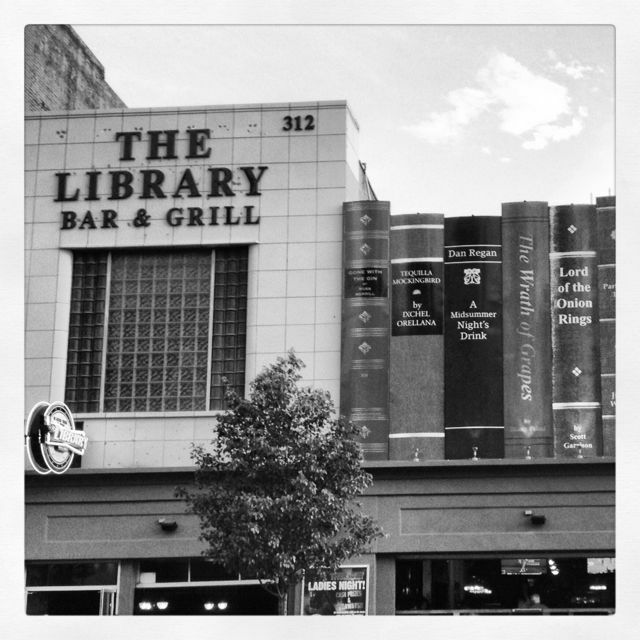 Wherein we distill thoughts on ALA Annual 2014. First up, a couple of non-preservation sessions. The preservation notes will be posted soon. Jennifer Kahnweiler, PhD, author of A Quiet Influence: The Introverts Guide to Making A Difference, gave the ALCTS President’s Program keynote on the power of quiet influence and the strengths that introverts bring to the workplace. When asked to raise their hand in response to the question, “How many of you are introverts?” roughly 95% of the audience agreed. This is not a surprise to anyone in Libraryland, right? What is different is that Ms. Kahnweiler, who self identifies as an extrovert, is not out to make us into something we are not or to imply, as so many do, that being an introvert is a bad thing or that we should necessarily change into extroverts. She was here to instead help us realize our strengths and help us identify how we can use those strengths to better navigate our work. By definition introverts are energized from within while extroverts get energized by people and places around them. Neither is a bad way of being, they are just different. Let us remember, too, that while you may have tendencies one way or the other, we often possess qualities of both the introvert and the extrovert and some of us have learned to “turn on” one or the other when the situation requires. Introverts are found in every industry and they can exact influence even if they are not in positions of power by challenging the status quo and inspiring change. Introverted leaders tend to be more analytical and listen more to their employees. According to Kahnweiler, we need introverts’ quiet influence now more than ever. Kahnweiler suggests ways that introverts can successfully navigate the workplace. If you manage introverts, these are good things to realize and provide space for if you want the most out of your staff. 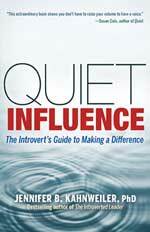 She stresses that introverts make an impact by quietly influencing people. These “ripples of influence” can change the workplace and make a huge impact on individuals and organizations. Preparation—Taking time to adequately prepare for meetings or presentations helps alleviate anxiety. Taking quiet time—Introverts are thinkers and need time and space to think through problems and find solutions. Engaged listening—Listening provides a chance to build rapport and understand issues and concerns at a deeper level. Engaged listening is about connecting to the other person, not making the conversation about yourself. Of course, if all you do is listen, you run the risk of being perceived as not having an opinion or an idea. You also run the risk of being the person in the office people come to so they can vent, which can be stressful. Key tips: don’t multi task, bracket your thoughts (take random thoughts and put them in a ‘parking lot’ so you can concentrate on listening and being present), ask yourself “what can I learn from this?,” and move your body and be healthy. Writing–Introverts can use writing as a way to gather thoughts and express ideas. Thoughtful use of social media–She urges introverts to start with just 15 minutes a day and try social media as a way to build community and make connections. This is one part of her talk that really didn’t wring too true for me personally. I find that librarians and archivists have embraced social media with vigor, but then that is the pool in which I swim so maybe more people than not feel social media is too stressful. Susan Cain, “The Power of Introverts” TED Talk (February 2012); an animated version from RSA Shorts is here. This was a great conversation starter, I only wish the session lasted longer. My library is new to Tumblr and we are trying to build our community there. We will be participating in the #5DaysOfPreservation event the week of July 14th to help build that presence but I wanted to attend this to find out more. If you are on Twitter, search #tumblariantalk for posts from the panel discussion. The panelists started with very brief statements with the conversation following. The panelists’ slideshows are online. A list of Tumblarians including some on the panel can be found on The Lifeguard Librarian’s site. Highlights data, services, health, archives, etc. How do you measure “success” with social media? Responding to criticism, some do, some don’t. Most of the Tumblarians on the panel were trying to make special collections accessible and don’t get a lot of negative feedback. When you reblog, try to add info or sources that you may have that can add to the conversation. How do you engage with students directly? Enable questions, put email on account, keep track of local community tagging trends. Censorship, should we or no? Mostly no, one person did take down one post by request, she had permission to post a photo but made it into a gif and the person who gave permission didn’t like that and requested they take it down. Conferences are not all about the sessions. The Good News: AIC’s Conservators Converse has done a great job of blogging talks from the annual conference. If you are looking for the Book and Paper Group sessions, the Electronic Media Group sessions, the Photographic Materials Group sessions, or any other session, you can easily find them (filter by category for ease of finding what you want). This is a fantastic way to share the event and kudos to them for wrangling so many people to blog the sessions. The Bad News: You can now find almost all of the sessions on the Conservators Converse blog, which leads very little for me to post here. So what is left for me to talk about? Let’s start with the session I participated in, “Communicating Conservation.” The panel was expertly put together by Nancie Ravenel, author of Social Media for Collections Care wiki. The panelists discussed how they use various social media and gave tips for effective blogging. Melissa and I focused on what platforms we use and why, who our audiences are and some of the ideas we have come up with that have been successful. Our presentation is available online. The presentations have been written up for Conservators Converse by Rose Cull (thanks Rose!). There is a good discussion going on over there and I encourage you to chime in. I wrote more about the resulting discussion and my lingering questions over on Preservation Underground. As a blogger both here (the “personal” me) and as part of my institution (the “professional” me), I am stuck on this idea of participation and how we can increase readership and response. It is called “social media” after all, which implies something beyond the simple act of writing. It’s been difficult with this blog to inspire conversation, although we have some loyal readers and responders and we are thankful for all of them. But all bloggers hope to spark ideas, share experiences and talk with people. How can we get more readers to comment or even to write guest posts? What content really gets your attention? Without feedback we are just shouting into the wind and expending energy that we could better channel elsewhere. Which leads me to the next point, that of eyeballs, attention spans and the proliferation of really interesting blogs. When Holly and I started this blog there were not many preservation blogs out there. There were some, mostly personal blogs, but not too many that discussed issues or trends in the profession. Now we are competing with so many really great blogs that I wonder if we have hit a saturation point and capturing anyone’s attention will be increasingly difficult. Are there too many blogs out there now? Are we simply competing with them or is there more opportunity to collaborate across blogs (I would personally love that)? Why are so many organizations reluctant to post their social media guidelines? I was asked during the discussion if my library has posted it’s blogging guidelines, they have not. I am in conversation with the key people who have the authority to make that happen, let’s just say the guidelines are still not available. You can find some on Nancie’s wiki, and Rose pointed to this link, but as we were putting our library’s guidelines together the organizations we found sharing their documentation were mostly small public libraries. Why don’t we share more with the public and with our colleagues? this came up at the Great Debate, too. I realize there are privacy issues, and sensitive subjects, and it’s hard to stick your neck out in a profession that loves to judge and question. But I do think we should continue this discussion of why we use social media, what best to do with it, and how we can share more. The Book and Paper Group held its annual business meeting on Thursday, May 10th. I estimated about 60 people were in attendance (a very, very small number of the membership…this will be important later). Next year we will be in Indianapolis, IN*. The theme of the conference is “The Contemporary in Conservation.” To me that means plastics, modern adhesives, maybe trends in conservation either at the bench or in our programs. What does it mean to you? I’d like to explore education (both for conservators and for our target audience) and advocacy (for conservation, conservation education, etc). Get your paper ideas in! As usual we gnashed our teeth about the budget and the fact that since we have spent down our reserves as we were told, we now have little in our wallet should we need it. Our esteemed secretary asked us to consider ways we can raise funds. The issue of the cost of the Annual came up and whether it is time to move to an electronic version to save money. The BPG Annual takes a very large portion of our available funds each year. We discussed (again) moving to an electronic version of the Annual with a print on demand option. The erroneous argument that printers want 1K orders before printing came up, as did the persistence of digital data (at least that part did at our table). These are both valid arguments, but not insurmountable problems if we do a little homework. Print On Demand The argument that printers require at least a thousand print orders for the publication before working with you is incorrect. I talked with a friend who works at a large commercial bindery that also offers POD services. If you want more than 1,000 issues is is cheaper to print your publication traditionally, but if you need less than that number POD becomes a viable option even for very small orders. He said they would print one copy of that is all you wanted, although a hundred or two or three would be more affordable per piece. Print As Archival Record The internet is not an archive, I think we can agree on that. With no print back-up we risk losing the work of our membership to the vagaries of the internet if we go e-only. That said, JAIC is deposited in JSTOR, which is a trusted repository for electronic publications. Does the BPG Annual meet the criteria of JSTOR? I’m not sure, but we should find out because depositing it with JSTOR and allowing POD for print is a great idea and would save us a lot of money. Move the Annual to an e-publication with the option for POD for those members who want print. BPG should print (pick a number) Annuals for deposit in traditional repositories that will commit to their preservation. AIC/BPG should deposit the Annual to JSTOR so that the preservation of the electronic publication will be assured. A hybrid approach (e-preferred publication in JSTOR with POD option) only works if JSTOR will take our publication. We need someone to investigate that (heck, all AIC interest group publications should be there). If JSTOR will not take our publication, we could still offer an e-preferred/POD option if we deposit enough paper copies in trusted libraries/archives that will commit to their long-term preservation and access. POD publications should be easy to order if you want one now or in the future. BPG should foot the bill for POD requests since the Annual is a benefit of our membership. If BPG feels members should pay for their own POD copy as was suggested at the meeting, they should reduce our dues accordingly. Hey, maybe with less expensive dues we could gain membership. Win-win! This is where things get interesting…voting on implementing changes when less than ten percent of your membership is at the meeting seems shaky and is a constant problem (7:30 a.m. meetings could have something to do with it). New discussion group guidelines were proposed that laid out how much time should be devoted to speakers vs. discussion, and some other things I neglected to write down (sorry…if you were there, please fill us in). The guidelines were proposed because the discussion groups in the recent past have done more programming with less time devoted to discussion and are becoming indistinguishable from the regular program. Much discussion ensued since “guidelines” are often interpreted as “rules” and the point of the discussion groups is to be more free-form and flexible in their programming. As someone who has done a lot of discussion group planning I see it as a failure of the co-chairs if enough time is not allotted for discussion. There are many ways to put a discussion program together, but you cannot have a discussion if you are left with little or no time to actually talk to each other. I don’t think we need rules from above on how to plan our discussion group meetings but I was in the minority and the guidelines were approved. The majority of the members present approved a new discussion group, the Art on Paper Discussion Group (APDG). This presents a conundrum as we now have three DG’s and our agendas are already pretty full. BPG offered two programming scenarios for vote (only two, really? I could think of at least one more scenario that wasn’t mentioned): Given that BPG will maintain 1-1/2 days of regular programming (therein lies the rub) we could have 1 of the 3 DG’s present each year, which means your group only meets every three years; or we could have 2 of the 3 DG’s meet each year with one having the year off. This one (2/year with one taking the year off) is the one that won the vote. So, I guess I’ll attend 2 out of every three AIC conferences since LCCDG is the primary reason I go to AIC any more. Don’t get me wrong, I appreciate all the hard work that goes into planning discussions, and programming is difficult. I’ve been there and done that and it is often a thankless job. But we will never be free of conflicting interests at a large conference, so using the straw-man argument that we want to reduce conflicting schedules and therefor relegate one interest group to oblivion every third year further marginalizes library and archives conservators in my opinion. I could go on, but I won’t. It is done, and now it remains to be seen what happens from here. Go forth and discuss. *Home of Shapiro’s, the best damned corned beef sandwich EVER!